In the past 20 years, Elekta has achieved measured growth through nearly a dozen acquisitions, pulling new radiotherapy, brachytherapy and magnetoencephalography technologies into the fold. 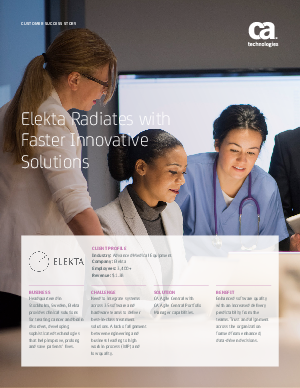 To deliver the full benefit of these sophisticated devices to providers and patients, Elekta must tie them together into integrated solutions— an immense and complex undertaking that can be further complicated by regulatory compliance. Read this case study to learn how Elekta’s success, particularly against the back drop of. The company’s success, particularly against the backdrop of a dramatically changing industry, can be traced in large part to an enterprise scale agile transformation at the portfolio management level. By introducing new ways of thinking about the work, the transformation is helping Elekta get to market faster with higher quality and predictability for customers.